It’s that time of the month again! The Daring Bakers challenge for November was my very first savory challenge since joining up: Tender Potato Bread. I’ve never used this recipe before, but I have made potato bread in the past, from a Nigella Lawson recipe in How to Be a Domestic Goddess . In addition, Jeremy has made the rosemary potato bread from The Bread Baker’s Apprentice , so we had a reasonable baseline for comparison. To make things a bit more interesting for myself, I was one of the crazy bunch that decided to make this bread fresh as part of our Thanksgiving meal. I got my start on the challenge last Wednesday evening, amid a bunch of other Thanksgiving prep activities. I used about 12 oz of russet potatoes for the batch, the equivalent of two rather small peeled potatoes. To save myself a bit of time, I got the dough started on the stand mixer, and finished off kneading by hand. 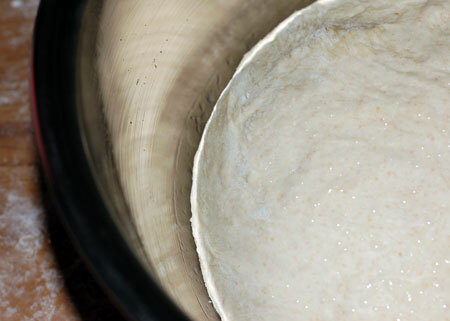 I found that, although the dough was very soft and sticky, it was manageable as long as I kept my hands and the surface well floured. By the time I decided to call it good, I had gotten up to around 8 cups of flour added in total. The oiled and covered dough was set aside to rise while I went about roasting pumpkin and making pies and boiling apple cider brine and such, so my kitchen was pretty warm for a change. 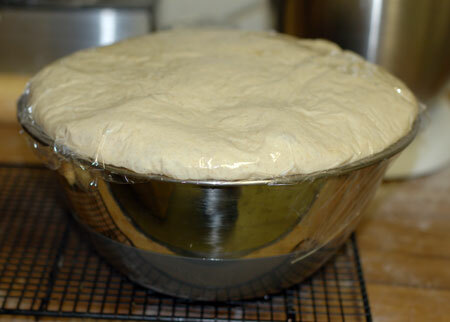 It was a good thing I picked my largest bowl to proof in, because in a few hours, the dough was about ready to bubble over the sides of the bowl. I shaped half of it into a loaf of focaccia and half into rolls, and both got squeezed into the already-bursting fridge to retard overnight. The next morning, after starting my stuffing and getting my apple pie in the oven, the focaccia dough came out of the fridge for its second proof so that it would be ready to bake by lunchtime. Soon it was pillowy and light again, ready to dimple and drizzle with olive oil. 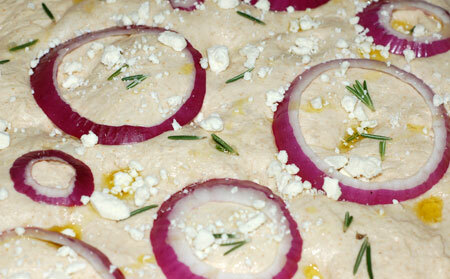 I topped my focaccia with red onion rings, fresh rosemary, and a scattering of feta and fleur de sel. We both enjoyed this focaccia, which came out with a tender, fluffy crumb and lots of flavor thanks to the toppings. And, I might add, it paired really nicely with the soup, sliced into rectangles. But there’s no rest for the wicked. While our lunches were still settling, I flung myself into turkey preparations and pulled the muffin pan of cloverleaf rolls from the oven for their second proof. 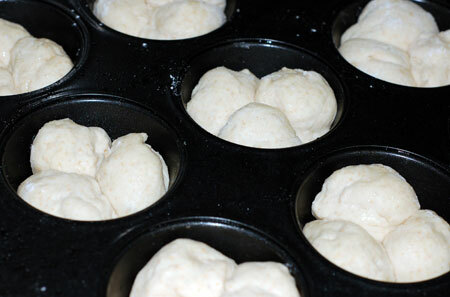 The rolls were rather more challenging to shape than the foccacia because the dough was still very sticky. Twelve cloverleaf rolls meant 36 little balls of dough that had to be shaped, each of which stuck tenaciously to my hands even with frequent reapplications of bench flour. When the turkey was done, the rolls (and some green beans and shallots for roasting) went in the oven. Somewhere in between making gravy, mashing potatoes and pureeing yams with vanilla-scented cream, I pulled them out to cool and rubbed their browning tops with a pat of butter. Then we loaded up our plates and dug in. Everything tasted great, but unfortunately the cloverleaf rolls came out more like bread-shaped building blocks than actual bread. I think it may have had something to do with the metal muffin pan, which I don’t use much anymore. The good news was that we had so much other good food to eat, including the remains of the focaccia from lunch, that we didn’t miss the rolls at all. Because of the way the rolls turned out, I didn’t quite feel that I had done the challenge justice, so yesterday I decided to give it one more shot. This time I made a half batch of dough with 4 oz of potato in order to bake a single loaf. I used bread flour by choice (and because I am fast running out of AP), but accidentally grabbed white whole wheat flour instead of the normal stoneground variety. I kneaded entirely by hand for about 15 minutes, and added about a cup of flour. Again, the dough rose phenomenally well, and when I punched it down to reknead, I added in a tablespoon or so of chopped fresh rosemary, and shaped it into a tight little boule. 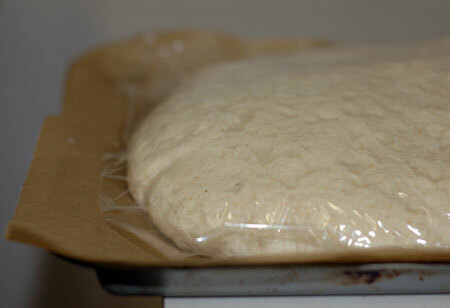 When I came back to check on the dough again about an hour later, it was easily more than doubled in size. Visions of The Blob were starting to run through my head, but fortunately it hadn’t quite outgrown the square of parchment paper I proofed it on. I gave it a few slashes and some decorative sprinkles of flour, and slid it from the baking peel onto the hot baking stone. Forty minutes later, it was golden brown and crisp with an internal temperature approaching 200F, and I had a hard time waiting for the allotted half-hour before slicing into it. This was a relatively straightforward recipe: I had few problems in working with the dough, and no trouble at all in getting it to rise. My dough was a little too soft and sticky to sustain shaping, hence the big flat boule. I’d say this recipe is best suited as a palette for focaccia, and that doesn’t need much in the way of shaping. The other option would be to continue adding flour until I get a different consistency of dough, but that might affect the chew. 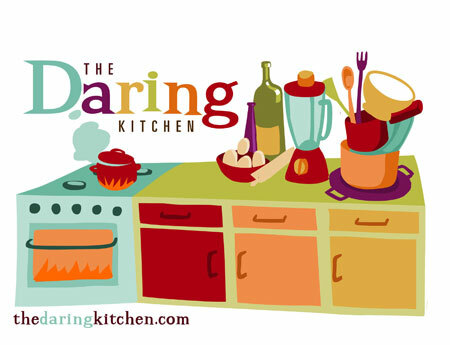 Make sure to check out the Daring Bakers blogroll to see everyone’s creations. And thanks to Tanna of My Kitchen in Half Cups for choosing a savory challenge this month, since we’ve got desserts to spare around here already! You can find the potato bread recipe on her website here. Two times!!!! Wow. Great job. Both efforts looked pretty good, bit I do understand why you wanted a do over with regard to the rolls. The focaccia looks amazing! 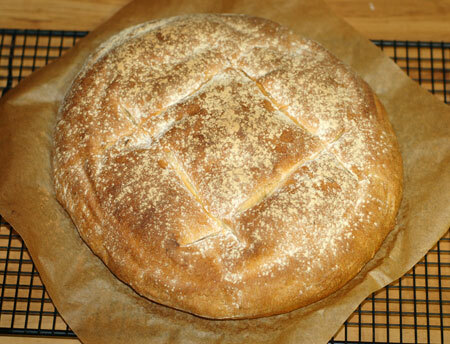 I have made the rosemary potato bread from the Bread Baker’s Apprentice as well. 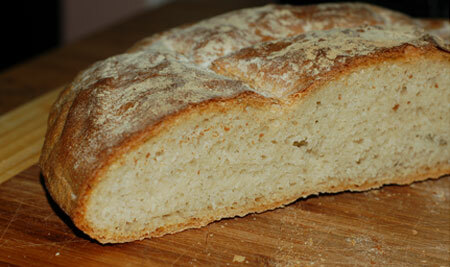 Although I liked the foccacia from this month’s challenge, I liked Peter Reinhart’s recipe better for a loaf. I love your foccacia – the feta sounds amazing on it! Oh, wow. You were far braver than I. I quickly abandoned the idea of using the clover leaf shape when I poured the dough onto the island to start kneading 🙂 They look terrific! You were daring in attempting to make this recipe for Thanksgiving day…. even though the rolls didn’t turn out quite the way you had hoped, your focaccia was beautiful. I had similar problems with this dough – but I will try this recipe again now that I know what I am in for. Fantastic job on this month’s challenge. I love your second attempt and the rustic loaf does have wonderful crumb! So brave to make this bread for thanksgiving day, and clover leaf rolls to boot! WOW! Good for you. Sorry the rolls didnt turn out. But the focaccia looks great! Well done! I’m impressed with everything you made especially the little rolls! I love the clovereleaf rolls…they are my favorite shape for rolls. I love all the shapes you made. 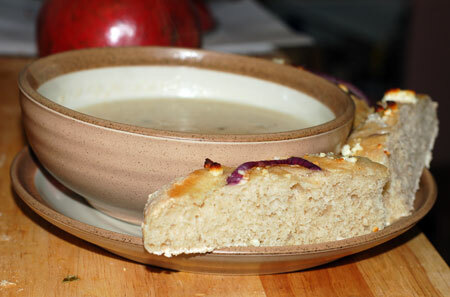 The focaccia looks really special with the red onion, I bet it was great with the soup! Your Thanksgiving dinner posts sound like you had an amazing time! I commend all of you who made this on Thanksgiving Day! Your bread looks lovely, and I love the rings of red onion you used to top your focaccia. Ah, the cloverleaf rolls! I made some of those for Thanksgiving, too. All of your breads look lovely and I definitely commend you for doing this on Thanksgiving! Great job! You did a wonderful job on your bread. I’m in awe that you accomplished this recipe for your Thanksgiving dinner. The small rolls are so cute, great idea! The focaccia is perfectly lovely. I think the rustic loaf looks good too. Hats off to you for making it on Thanksgiving Day! All of your variations looks great!! 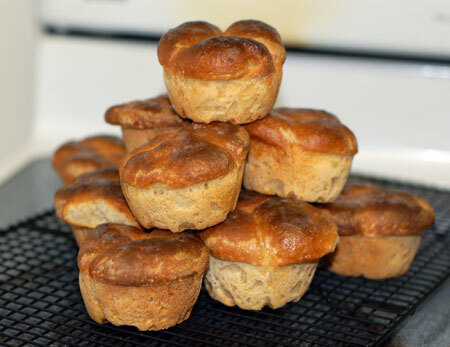 Love the cloverleaf rolls – well really everything you made is just beautiful! Your breads look great! That focaccia looks lovely! Well done! Your breads look wonderful! I’m sorry your clover leafs didn’t turn out, but your tenacity is commendable in the midst of everything else that was going on! Thanks, everyone, for the kind comments! I put a few unbaked rolls in the freezer since they wouldn’t all fit in my muffin tin (I shaped in my smaller silicone pan, and froze the whole thing, then removed the dough to a Ziploc). I don’t have great hopes that it will revive well, but I thought it would be fun to try. Belated congratulations for your stick-to-it-iveness with this elusive challenge… especially with the pressures of preparing the great holiday meal. Your focaccia looks fabulous!